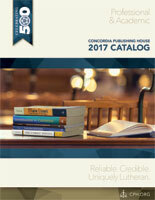 Volume 57 of Luther’s Works presents sermons by Martin Luther from the 1530s. During this period, much of the reformer’s preaching was topical, addressing key points of doctrine in response to internal and external challenges to the evangelical presentation of the Gospel. In January and February 1534, Luther preached a series of sermons on Baptism, which it is believed Caspar Cruciger (1504–48) later edited for publication. The following excerpt comes from the sermon of February 2, 1534 and addresses how Baptism does have, and must have, a real effect on the lives of Christians, as they live as members of the Body of Christ and exhibit the fruit of Baptism. Here it is apparent how the devil obstructs us at every turn so that, while Baptism is not treated incorrectly, it nevertheless remains without fruit among us. Although it was without our works and good life that we found grace to obtain Baptism correctly, we are still to devote ourselves to honoring and adorning it with words and works and our whole life from now on. Baptismal fonts, altars, and pulpits are there to remind us of this. Since they are to bear witness to the fact that we are baptized and Christians, we should also plan to honor the baptismal font and so live that we may view it with joy and that it may not bear witness against us. But tragically, many now act as if they might as well always remain as before in their old skin, live as they please, and so make their glorious Baptism only a covering for their shame, as though they had been called to the kingdom of grace in order to have the power to do as they wish. Despite this, they assure themselves that God is gracious and make the excuse: “I am a weak man. Surely God will take this into consideration and forgive me,” etc. No, not so, dear brother! I did not point you down that path so that Baptism should grant the liberty to sin. Quite the opposite! Your sins have been remitted, and you have now come into favor (who were before in disfavor because of sin) so that you might now live another life and depart from sin. Being baptized and remaining in sin do not go together. It is given for the very purpose of taking sin away so that man would become just and increase in good works. If he was disobedient, angry, spiteful, unfaithful, and unchaste before, he is to depart from that, pray an Our Father instead, and from that point on take care and strive to be obedient, patient, and kind. If you do not do this, do not think that all is well with you nor boast about the grace of Christ a great deal in order to justify your sin. It would certainly be significant, if you should find yourself so greatly improved that, for a year or two or some length of time, you would not become angry, curse, etc., as before. Then, if you should fall once or twice through oversight or weakness, people could take this into consideration and offer you encouragement again. But remaining in your former ways and persisting in being angry, impatient, and spiteful shows that you have received your holy Baptism to your great harm. Likewise, if you had been an adulterer, fornicator, or coveter, then Baptism should teach you from that point on not to strike, commit adultery, covet, steal, and rob any longer. The former is forgiven and dead, and from that point on there is to be a different, just, righteous, beneficent, disciplined man. If you find such life and fruits in yourself for a length of time, it is a sign that Baptism has taken effect in you. If it should happen that you go amiss in one or two things, which would be called falling and stumbling, you may take comfort in grace and forgiveness; yet not in such a way that you would remain lying in it or continue and keep saying: “What can I do about it? I cannot get rid of it. Anyway, all is grace and forgiveness,” etc. He will not tolerate that, for thereby you only anger God and go farther and farther from grace until you lose it entirely and finally fall under punishment, even into the accursed sin whereby you despise and slander Baptism and grace, as do the devil’s factions. Consider your own life, therefore, and see how it accords with Baptism, and know that even though you have been called and placed into the kingdom of grace and made a partaker through Christ of all that Christians have, yet if you always remain as before, it cannot be beneficial to you, since you are not honoring your Baptism or keeping it pure. While you might be called a Christian, you have let go of Christ, sin is your lord, you are serving the devil, and you have no more than the name and appearance of Christianity by which you deceive yourself and do yourself harm. As I said before, He not only gave this Baptism and Sacrament for the purpose of forgiving and washing away sin by it but also wishes thereby to purge every day whatever sin still remains, and blot it out completely, so that we become quite a different kind and manner of people, inclined and equipped for every good work. Where it has been rightly received, sin will surely be found to decrease and diminish daily. Where it is not, the opposite appears, so that, while you may have put on the wedding garment, | there is filth under it with which you soil it and forfeit its beauty. If we want to have this glorious grace, it is necessary that we adorn Baptism and hold it high as a noble, beautiful jewel. This “adornment” is our living a life above reproach. Thus St. Paul teaches (Titus 2 [:10]) servants and [those in] other estates to live in such a way as to adorn the salutary doctrine in all things. How? By being obedient, not dealing dishonestly, not working mischief, etc. This is the beautiful wreath which adorns Baptism, gives it a good reputation and acclaim before everyone, and testifies to us that we have received it fruitfully and are true Christians. By contrast, whoever does not live in his estate as he ought dishonors and disgraces both his own doctrine and his Baptism, and bears witness against himself that he is unworthy of grace and is no more than a blot and stain upon Christians, as Peter ( Peter 2 [:20]) calls such people. Therefore, let us earnestly and diligently seek to be found among those who also embellish and adorn this high treasure of ours with their life and conduct, that we may joyfully boast in these before God and all the world and not be ashamed. Then we will not end up like the others who have lost Baptism. All that they taught and did, or still teach and live, has become futile—indeed, damning to them—and now they are seven times worse off than before [Luke 11:26]. Because they have abandoned this treasure, it is their fitting punishment that they are now hopelessly deceived by all kinds of false doctrine; because they did not pay heed to doing true good works to the glory of Baptism, they must now be driven and afflicted with false good works and do all that the devil wants through his deceivers. The same can happen to us also if we are not concerned and vigilant to avoid losing this precious treasure of the Word and blessed Baptism. He who gave it can also have it taken away again, even as the devil seeks and endeavors to do with all diligence. Let that be enough as a brief admonition for ourselves, for we must use preaching both to refute false doctrine and to rebuke sin, so that both doc­trine and life may proceed correctly and so abide. Amen. Amended from Luther’s Works Volume 57, pages 186–89. © 2016 Concordia Publishing House. All rights reserved.